Udupi is a divine shrine in the coastal region of Western Ghats. Udupi Sri Krishna Temple situated about 60 kms from Mangalore, it is a fairly large and upcoming town that was sanctum of Madhvacharya, the great Sanskrit Philosopher. The famous temple here, has a fascinating idol of Lord Krishna that is richly adorned with jewels. It is the center for education, social and religious activities in the district of Dakshina Kannada. It is known for the famous Sri Krishna temple. The reasons for its fame are the statue of Sri Krishna installed by the great saint Sri Madhvacharya and the penance and influence of Sri Vaadiraja yathivarenya. Another attraction of this temple is the ‘Kanakana Kindi’ – a small window through which Krishna is believed to have given darshan to his ardent devotee, Bhaktha Kanakadasa. There are three temples in Udupi. 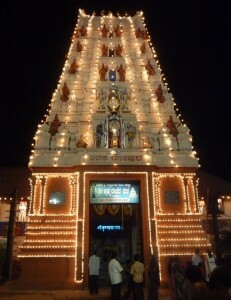 Chandreshwara, Anantheshwara and Sri Krishna temple. Chandreshwara and Anatheshwara are the most ancient temples of Udupi. Devotees perform ceremonies in a large scale daily. The offerings start in the early morning at 5 o’ clock and continue throughout the day. Different festivals like Madhvanavami, Ramanavami, Nrisimha jayanthi, Bhagirathi janmadina, Krishna Leelothsava, Ganesha Chathurthi, Anantha Chathurdashi, Subrahmanya shashti, navarathri dasara, Holi, Vasantha Puja, Jagarana seva, Thulasi Pooja, Laksha deepothsava, Dhanu Pooja are celebrated in the temple. Special ceremonies and religious discourses take place on these festivals. Prior to Makara Sankramana ceremonies are conducted with grandeur and pomp for seven days, called as Sapthothsava. On the eighth day lakhs of people watch the magnificent Churnothsava. Once in two years, on the 18th of January, ceremonies are held in grandeur and pomp during the transfer of the Sri Krishna pooja diksha called as Paryayothsava. Tourists from all over the country and abroad come to Udupi to watch Sapthothsava and Paryayothsava. 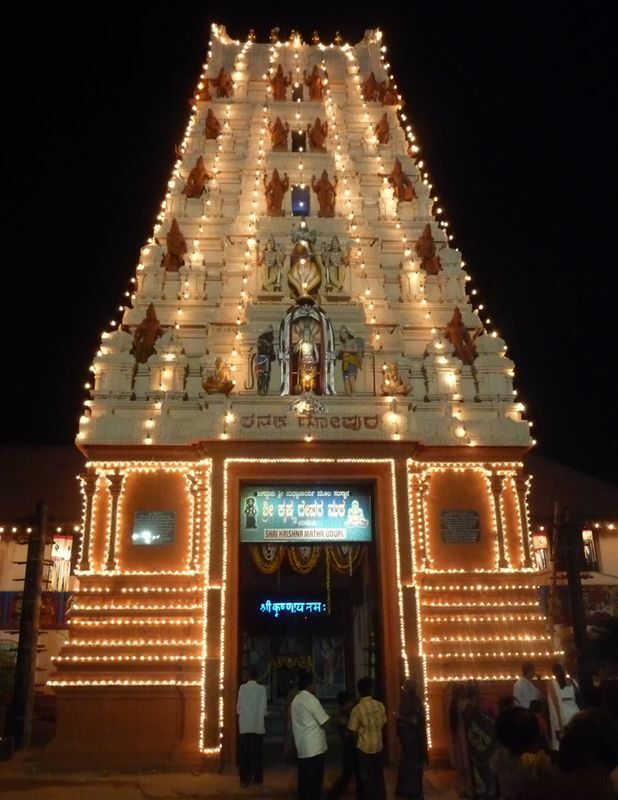 Another major attraction of Udupi is the golden chariot, which was offered to Lord Sri Krishna. This entry was posted in Holidays, Karnataka, Temples and tagged Anantha Chathurdashi, Bhagirathi janmadina, Chandreshwara, Dhanu Pooja, Ganesha Chathurthi, Holi, Jagarana seva, Kanakadasa, krishna, Krishna Leelothsava, Laksha deepothsava, Madhvacharya, Madhvanavami, navarathri dasara, Nrisimha jayanthi, Ramanavami, Subrahmanya shashti, temple, Thulasi Pooja, udupi, Vasantha Puja. Bookmark the permalink.